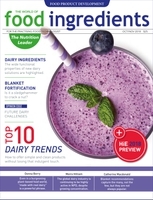 --- Key suppliers offer their thoughts on trends in the dairy ingredients space. How big is the challenge faced by the dairy alternatives market? 30 Oct 2018 --- Key suppliers offer their thoughts on trends in the dairy ingredients space. How big is the challenge faced by the dairy alternatives market?